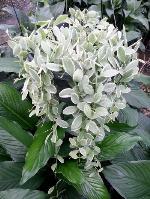 With beautiful frosted plum foliage, this Alcantarea specimen is great for any entryway and can grow to a large size. 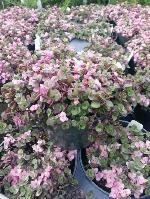 Pink Lady makes a beautiful basket plant with small multi-colored leaves and purple undersides. Easy to grow and similar in texture to a succulent. It's creeping habit also allows it be utilized as a colorful ground cover in semi-shade. 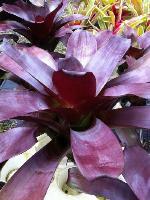 This striking cordyline puts on quite a show! Elongated dark green leaves with pink-purple petioles. The leaves orient themselves in relation to the sun, creating a elegant fan shape. Indeed, a show-stopper in the landscape! A Hawaiian Sunshine Nursery original. 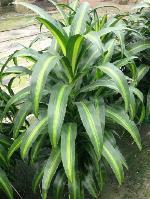 The glossy varigated leaves of this dracaena variety is superior to others. Does very well in full shade and won't loose it's varigation; perfect as a taller interior plant. 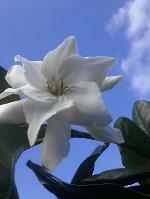 The scent of this spectacular gardenia fills the air, giving it the name 'Heaven Scent' Gardenia. 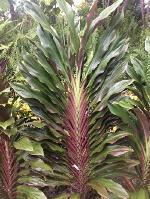 This plant can reach 10-15' tall and has shiny green foliage in addition to it's special flower. The perfect landscape plant either as a single large specimen, or a maintained hedge. A rare golden-flowered gardenia with an incredibly strong scent. 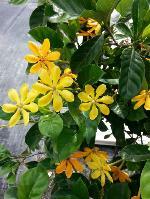 Kula Gardenia is a slow growing shrub with leathery leaves and flowers that change color from ivory through yellow to orange as they mature. Wonderful as a stand alone plant in the landscape or as a hedge. Also known as “Jamaican Poinsettia, this unusual shrub has showy red bracts and a brilliant display of golden yellow flowers. 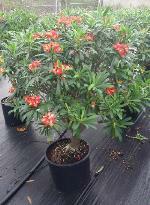 This drought tolerant euphorbia is an evergreen from Jamaica that can reach up to 12 feet tall. Use in the full sun landscape for it's attractive shape and color contrast. This fragrant shrub is a Hawaii favorite! 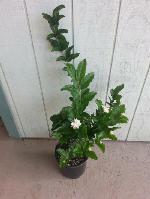 A drought-tolerant bush with vining tendrils that is perfect along walkways. Kalanchoe lucidus Fantastic (P) is a wonderful variegated variety of the Flapjack Plant. 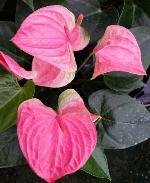 Gold variegation shows on the leaves all year with dark red markings on a light green leaf. During the color time of the year Fantastic lights up with Reds like it was on fire. Absolutely spectacular in it's best form. In Hawaii, this is an HSN exclusive. This is another discovery by the owners of Fantastic Gardens of Hawaii. Sourced exclusively from Hawaiian Sunshine Nursery, Inc., this compact self heading form of selloum is excellent in mass plantings or as an entryway accent. 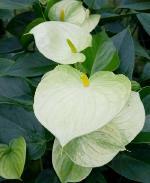 Thrives in both full sun and deep shade.